CFCF 2013: PLANNING FOR ANOTHER YEAR OF TALENT AND FUN! Cabin Fever Clay Fest 2013!!! So pleased to be celebrating this conference for the 6th year in a row! This event will be held at the Holiday Inn West in Laurel, MD from 15-2o February 2013. This is the only event of its kind that offers so many instructors with such diversity in their work. There will be 14 instructors teaching 29 workshop offerings! Demos by instructors and attendees, and a special celebration on Tuesday night honoring Lindly Haunani, the 2013 Creative Pioneer and Innovator Award Honoree. Join us for the fun…whether a newbie or professional, you are guaranteed to learn something new and make friends to play and clay with. Detailed workshop information can be found HERE. ROSA MARTHA CELORIO ACEVES – Appliquéd Bisque Bead Pendant – Sun. 17 Feb.
JANA ROBERTS BENZON – GLAZED STONEWARE BEADS – Sat. 16 Feb.
LINDLY HAUNANI – Translucent Innovations – Exploring Folded Bead Forms (2-day pre-conference) Intermediate to advanced skill level (or confident beginner) Fri. 15 Feb. – Sat. 16 Feb.
DOREEN GAY-KASSELL – GANESHA TRIPTYCH — Sat. 16 Feb.
ELLEN MARSHALL – Color, Surface Treatment, and A Little Bling – Fri. 15 Feb.
IRIS MISHLY – SKYSCRAPER AND FLAKES – Sun. 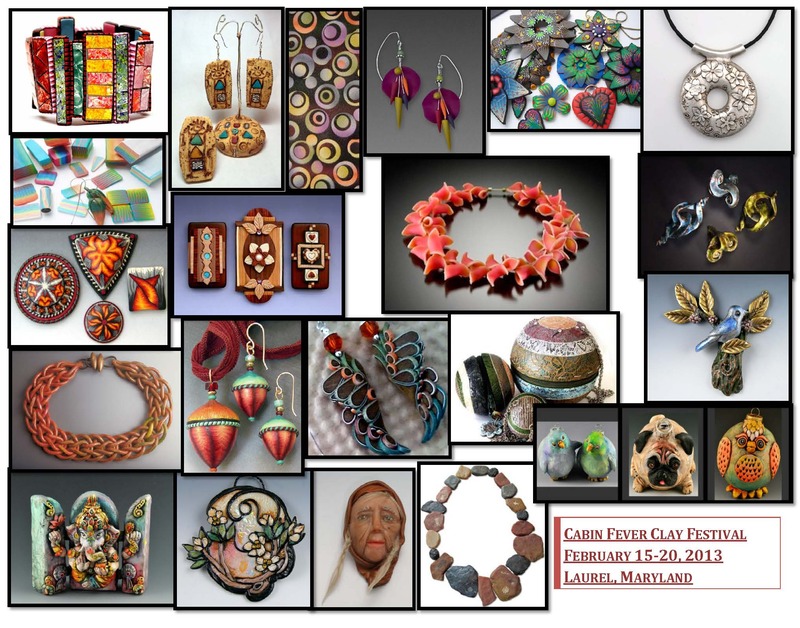 17 Feb.
NAN ROCHE – LOOP-IN-LOOP CHAINING – Fri. 15 Feb.
CHRISTI FRIESEN – Spectacular Stained Glass Pendants □ Wed. 8:00AM NOTE: This workshop will be taught only once during CFCF 2013. CHRISTI FRIESEN – Fee Fi Faux Fabulous! sculptural pieces and focal beads Using metal coatings and colors with polymer□ Wed. 1:00PM NOTE: This workshop will be taught only once during CFCF 2013. TOMMIE HOWELL – “I’VE BEEN FRAMED!” □ Sun. 6:30PM NOTE: This workshop will only be taught once during CFCF 2013. DOREEN GAY-KASSEL – SCULPTURAL BIRD AND BEAST ORNAMENTS □ Sun. 6:30PM NOTE: This workshop will only be taught once during CFCF 2013. OTTMAN – IT’S ABOUT COORDINATION! □ Sun. 6:30PM NOTE: This workshop will only be taught once during CFCF 2013. MARIE SEGAL- BETWEEN THE SPACE CANES □ Wed. 8:00AM NOTE: This workshop will be taught only once during CFCF 2013. MARIE SEGAL – SHADEPLAY CANING (4-hour workshop)□ Tues. 8:00AM NOTE: This workshop will be taught only once during CFCF 2013. Any way of getting more info on the classes? Like pictures of items being offered on the different classes. Hi, Ida. I sent you info in an email, but you can find the info here https://polymerclayfests.wordpress.com/cfcf-2013-registration-page-and-info/. Hope to see you in February.